This page provides free access to model building codes, specific provincial, state, city or other building codes and various building standards. We include contact information for various model building code authorities. 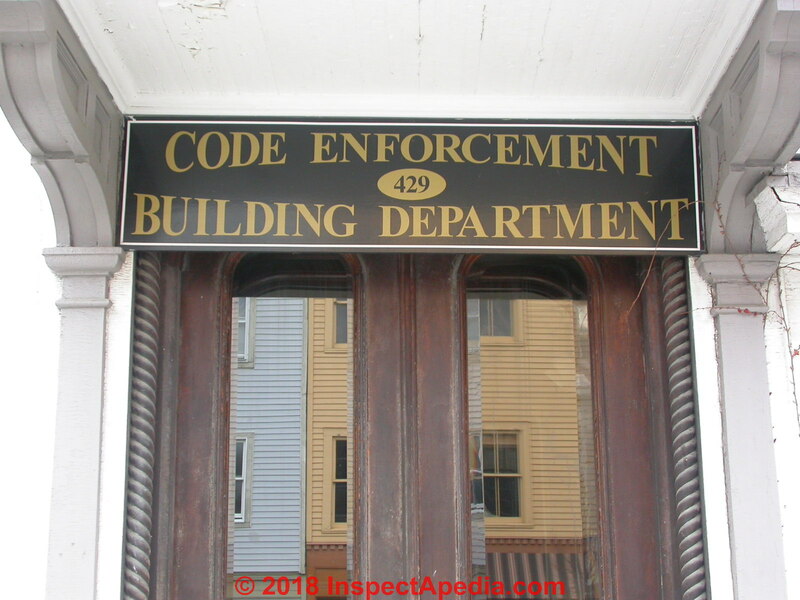 Page top photo: the building department's code enforcement office in Hudson, New York. This section of this page provides downloadable PDF copies of various building codes & standards. We also provide contact information for various building code & standard agencies. Some of these permit free online access to building codes in non-printable or non-downloadable versions and all of the code agencies permit purchase of copies of the codes they maintain. Because various states or provinces also have adopted versions of the model codes, often a copy of these is available from the state or province at no charge. Tip: use your browser's on-page search feature (CTRL-F or on a Mac CMD-F) to look for one or two keywords narrowing your interest, such as "septic" that will find septic system design codes & guidelines. Or use the InspectApedia page top or bottom SEARCH BOX to find articles including codes on a specific topic. The 2016 NCC was adopted by the Australian states and territories on 1 May 2016. NCC 2016, Complete Series contains NCC 2016 Volumes One, Two, Three, The Guide and the Consolidated Performance Requirements. The series is a uniform set of technical provisions for the design and construction of buildings and other structures throughout Australia, which allows for variations in climate and geological or geographic conditions.
. It is a uniform set of technical provisions for building work and plumbing and drainage installations throughout Australia whilst allowing for variations in climate and geological or geographic conditions. The NCC is an initiative of the Council of Australian Governments (COAG) developed to incorporate all on-site construction requirements into a single code. The NCC is comprised of the Building Code of Australia (BCA), Volume One and Two; and the Plumbing Code of Australia (PCA), Volume Three. In Canada, a building permit is required when constructing new or when renovating the structure of any existing porch or deck that is 24” high or greater above finished grade. Website Excerpt: Established by the National Research Council of Canada (NRC), the Canadian Commission on Building and Fire Codes (CCBFC) develops and maintains Canada's National Model Construction Codes.
. It also applies to the alteration, change of use and demolition of existing buildings. Over 360 technical changes have been incorporated in this new edition. Website Excerpt: The EN Eurocodes are a series of 10 European Standards, EN 1990 - EN 1999, providing a common approach for the design of buildings and other civil engineering works and construction products. They are the recommended means of giving a presumption of conformity with the basic requirements of the Construction Products Regulation for construction works and products that bear the CE Marking, as well as the preferred reference for technical specifications in public contracts. Website Excerpt: The IEC and ISO are both independent, non-governmental, not-for-profit organizations that develop and publish fully consensus-based International Standards. Website Excerpt: The National Building Code of India (NBC), a comprehensive building Code, is a national instrument providing guidelines for regulating the building construction activities across the country. It serves as a Model Code for adoption by all agencies involved in building construction works be they Public Works Departments, other government construction departments, local bodies or private construction agencies. The Code mainly contains administrative regulations, development control rules and general building requirements; fire safety requirements; stipulations regarding materials, structural design and construction (including safety); building and plumbing services; approach to sustainability; and asset and facility management. 2009 INTERNATIONAL BUILDING CODE IBC [PDF] Full Text, entire code, from the International Code Council (ICC) from the U.S. state of Washington's copy. Compressed, no data loss, for faster downloading. Also see Subtitle B - REGULATIONS Relating to Housing and Urban Development (Continued) [PDF] - original source www.gpo.gov/fdsys/pkg/CFR-2001-title24-vol5/pdf/CFR-2001-title24-vol5-subtitleB.pdf. Scope: 501.1 Scope. This chapter shall govern the installation, maintenance, repair and approval of factory-built chimneys, chimney liners, vents and connectors and the utilization of masonry chimneys serving gas-fired appliances. The requirements for the installation, maintenance, repair and approval of factory-built chimneys, chimney liners, vents and connectors serving appliances burning fuels other than fuel gas shall be regulated by the International Mechanical Code. The construction, repair, maintenance and approval of masonry chimneys shall be regulated by the International Building Code. Manufacturers of certified products and related information. Publication date 2011 Usage CC0 1.0 Universal Topics law.resource.org, public.resource.org Collection publicsafetycode; USGovernmentDocuments; additional_collections Language English In order to promote public education and public safety, equal justice for all, a better informed citizenry, the rule of law, world trade and world peace, this legal document is hereby made available on a noncommercial basis, as it is the right of all humans to know and speak the laws that govern them. Provides requirements for the selection and installation of electrical equipment, and design and testing of electrical installations, especially with regard to the essential requirements for safety of persons and livestock from physical injury, fire or electric shock. The presentation of this edition differs from previous editions of AS/NZS 3000 in that the Standard comprises two parts but with both parts bound as one document. Part 1 provides uniform essential elements that constitute the minimum regulatory requirements for a safe electrical installation. Part 2 provides installation practices that achieve certainty of compliance with the essential safety requirements of Part 1. UK Electrical standards and approved codes of practice [Website] http://www.hse.gov.uk/electricity/standards.htm includes UK Electrical Code, BS 7671 Requirements for Electrical Installations, IET Wiring Regulations "The Regs"
NFPA 70: National Electrical Code 2017 Edition, is available from the NFPA - http://catalog.nfpa.org/NFPA-70-National-Electrical-Code-NEC-Softbound-2017-Edition-P16529.aspx but keep in mind that in the U.S. your local jurisdiction may be operating under an earlier edition of the NEC. The U.S. Department of Energy (DOE) is directed to participate in industry processes to develop model building energy codes, issue determinations as to whether updated codes result in energy savings, and provide technical assistance to states to implement and comply with the codes. GAS EXPOSURE LIMITS - what are the allowable toxic gas exposure levels? OSHA, NIOSH, etc. GAS EXPOSURE LIMITS & STANDARDS - at what level is exposure to a particular gas considered hazardous or toxic? Dunn, Vincent. Safety and survival on the fireground. Fire Engineering Books, 2015. Dunn, Vincent. Command and control of fires and emergencies. PennWell Books, 1999. §[C26-504.7] 27-345 Firestopping.- Concealed spaces within partitions, walls, floors, roofs, stairs, furring, pipe spaces, column enclosures, etc. that would permit passage of flame, smoke, fumes, or hot gases from one floor to another floor or roof space, or from one concealed area to another, shall be firestopped to form an effective draft barrier, or shall be filled with noncombustible material in accordance with the requirements of this section. Firestopping shall not be required where a concealed space is sprinklered in accordance with the construction provisions of subchapter seventeen of this chapter, or is constructed as a shaft. (a) Firestopping materials.- In buildings of construction group I, firestopping or fill shall be of noncombustible material that can be shaped, fitted, and permanently secured in position. In buildings of construction group II, firestopping may be of combustible material consisting of wood not less than two inches nominal thickness with tight joints, two layers of one inch nominal thickness assembled so that there are no through joints or of onehalf inch exterior type plywood with joints backed, except that noncombustible firestopping shall be used in concealed spaces of fire divisions and where in contact with fireplaces, flues, and chimneys. Noncombustible firestopping may be masonry set in mortar, concrete, three- quarter inch thick mortar or plaster on noncombustible lath, plasterboard at least three-eighths of an inch thick, fire-rated wallboard at least five eighths of an inch thick, sheet metal at least No. 14 U.S. std. gage thick, solid web metal structural members, asbestos-cement board at least one-quarter of an inch thick, or equivalent rigid noncombustible material. 1.1* Scope. A.1.1 This standard provides a range of sprinkler system approaches, design development alternatives, and component options that are all acceptable. Building owners and their designated representatives are advised to carefully evaluate proposed selections for appropriateness and preference. 1.1.1 This standard shall provide the minimum requirements for the design and installation of automatic fire sprinkler systems and exposure protection sprinkler systems covered within this standard. 1.1.2 This standard shall not provide requirements for the design or installation of water mist fire protection systems, which are not considered fire sprinkler systems and are addressed by NFPA 750. 1.1.3* This standard is written with the assumption that the sprinkler system shall be designed to protect against a single fire originating within the building. A.1.1.3 This standard also provides guidance for the installation of systems for exterior protection and specific hazards. Where these systems are installed, they are also designed for protection of a fire from a single ignition source. Flood protection provisions of the ICC IRC IBC Section 1612 are found in 2009 ICC IRC INTERNATIONAL BUILDING CODE (2009) [PDF] complete. International Mechanical Code (IMC), 2015 International Code Council Website: https://codes.iccsafe.org Tel:  422-7233, also see PVC HVAC DUCTS - excerpts from the International Mechanical Code pertaining to HVAC duct systems. The NCC 2014 Hard Copy, Digital & Online contains all volumes for both commercial and residential construction as detailed below. The digital format utilises a Digital Rights Management (DRM) system which requires the use of the ABCB's NCC Viewer* to access the file. Please note that the DRM allows for the installation of the Digital format onto 2 computers/notebooks. Online archives for the included volumes extending back 5 years from the date of the current edition are also provided as part of this package, noting that the PCA archives only extend back to 2011 when it was introduced. MANUFACTURED HOME CONSTRUCTION AND SAFETY STANDARDS, PART 3280 contains 10 subparts pertaining to General (data plate and certification contents and locations), Plans (dimensions, exits, etc), Fire Safety, Body and Frame, Testing, Thermal Protection, Heating/Cooling and venting systems, Electrical, and Transportation (axles, springs, drawbar). It's about 90 pages of regulations. MODEL MANUFACTURED HOME INSTALLATION STANDARDS-PART 3285 [PDF] discusses roof framing and loads and wind zone maps for vasrious roofing installation standards. MOBILE HOME CODES & STANDARDS - web article listing codes fo rmobile & manufactured homes. This is the complete HUD foundation handbook in PDF format, compressed for faster downloading, no loss of data, no loss of image quality. This handbook is a guide for those approving HUD-code manufactured homes on permanent foundations, including engineers, manufacturers, and site owners seeking approval. It provides current technical information, recommendations, and tables of analytical data, expanding and clarifying the definition of a permanent foundation. It updates 1989 loading requirements for snow, wind, and seismic forces. Because of the increased use of multi-section manufactured homes, the guide now includes consideration of large openings along the length of marriage walls in multi-section units. The construction recommendations assure that the home, foundation, and site are all compatible. In addition to the new technical recommendations, the guide has been expanded and reorganized for easy reference with more illustrations and clarifications. This document discusses factors to consider in manufactured home (& mobile home) foundation design, non-proprietary foundation and support systems, and proprietary foundation and support systems for mobile homes / manufactured homes. Note: The contents of this report are the view of the contractor and do not necessarily reflect the views or policies of the U.S. Department of Housing and Urban Development or the US government. Homes built prior to June 15, 1976, even with modifications, do not meet the HUD standards and cannot be accepted as compliant with the HUD Code. As the homeowner, you may find a licensed engineer willing to inspect your home for compliance with your state's housing code. FHA does not insure mortgages on manufactured homes built prior to June 15, 1976. Most other mortgage insurance firms follow FHA's policy. The oil tank piping installation and testing standards cited below are the most-widely adopted throughout states and cities in the U.S.
IMC, Chapter 13, FUEL OIL PIPING & STORAGE, as found in the 2006 INTERNATIONAL MECHANICAL CODE, ICC, International Code Council, 500 New Jersey Avenue, NW, 6th Floor, Washington, DC 20001, Tel: 888-ICC-SAFE (422-7233); Website: iccsafe.org/, Email: webmaster@iccsafe.org, Customer Store (buy publications) 800-786-4452. Also see 2009 International Codes and 2012 International Codes. NFPA 31, OIL STORAGE TANK INSTALLATION & PIPING [PDF] example as adopted by Warren County, VA, retrieved 2015/11/26, original source: http://www.warrencountyva.net/phocadownload/CountyForms/ BI_Dept/NFPA31%20Feul%20Oil%20Piping%20Installation%20and%20%20Testing.pdf. Graywater is untreated household waste water which has not come into contact with toilet waste. Includes: used water from bathtubs, showers, bathroom wash basins, and water from clothes washing machines and laundry tubs. Does not include: waste water from kitchen sinks, dishwashers, or laundry water from soiled diapers. California's Graywater Standards are now part of the State Plumbing Code, making it legal to use graywater everywhere in California. These standards were developed and adopted in response to Assembly Bill 3518, the Graywater Systems for Single Family Residences Act of 1992. How can I use Graywater? ow can I use Graywater? Graywater can be used to irrigate landscaping and plants but not on root crops or edible parts of food crops. Irrigati on lines can be either drip or leach systems and the discharge point must be covered by at least two (2) inches of mulch, rock, soil, or a solid shield to minimize the possibility of contact with humans and domesti c pets. Be aware that some soaps and detergents can contain a variety of chemicals to aid in cleaning that may be harmful to your plants. Avoid soaps with chlorine or bleach, peroxygen, sodium perborate, sodium trypochorite, boron, borax, petroleum disti llate, alkylbenze, “whiteners”, “soft eners”, and enzymati c components. Please contact a reputable landscape specialist for more information. What regulations should I know about? What regulations should I know about? On January 27, 2010, the State of California fi nalized the graywater regulati ons for Chapter 16A “Nonpotable Water Reuse Systems” into the 2007 California Plumbing Code (CPC). The emergency graywater regulati ons were enacted to help residents of California conserve water by facilitati ng greater reuse of laundry, shower water, and similar sources for irrigati on. In addition, by making legal compliance easy, the State hopes to reduce the number of non-compliant graywater systems. Your graywater system must comply with the 2007 CPC and other codes enacted by your local municipality or water purveyor. Presentation summarizing federal and state regulations, rules, regional differences; Kenny includes photos of proper and improper installations of gas equipment protection. 1.1* Scope. This code shall apply to the storage, handling, transportation, and use of liquefied petroleum gas (LP-Gas). A.1.1 General Properties of LP-Gas. Liquefied petroleum gases (LP-Gases), as defined in this code (see 3.3.43), are gases at normal room temperature and atmospheric pressure. They liquefy under moderate pressure and readily vaporize upon release of the pressure. It is this property that allows the transportation and storage of LP-Gases in concentrated liquid form, although they normally are used in vapor form. NATIONAL PLUMBING CODE (2009) [PDF] published by PHCC, This edition of the National Standard Plumbing Code includes changes from the 2007 and 2008 Supplements and the changes that were approved at the August 21, 2008 Public Hearing. This book presents specifications and requirements relating to the connection and use of natural gas supplied from facilities. It contains the minimum acceptable standards for gas piping and gas appliance installation necessary to ensure the safe and satisfactory utilization of natural gas by our customers. The information contained herein is intended primarily to assist the installer in the new gas installation process, but it is also intended for use by our customers, by architects and engineers, and finally, by people in various departments at National Grid . It shall be used when a customer's gas installation is new, when a customer is increasing gas usage from a smaller capacity, or when any changes are made from the original installation. It represents a collection of information which will provide for a safe, properly conceived, accurately sized and cost effective installation that will give long lasting, satisfactory service to our customers. Excerpt: The UMC established minimum requirements and standards for the protection of the public health, safety and welfare. 101.2 Scope. The provisions of this code shall apply to the erection, installation, alteration, repair, relocation, replacement, addition to, use, or maintenance of mechanical systems within this jurisdiction. ASPHALT SHINGLE ROOFING FOR HIGH WIND REGIONS, HOME BUILDERS' GUIDE TO COASTAL CONSTRUCTION [PDF], FEMA 499, August 2005, Technical Fact Sheet No. 20. U.S. SEPTIC AUTHORITIES & DESIGN SPECIFICATIONS - by-state list of septic and onsite wastewater design regulations, codes, guides. 2012 ATTIC ACCESS IECC-IRC STAIR CODE REVIEW [PDF] of Attic Access Requirements includes discussion of compliance with the 2012 IECC energy code for insulation and air sealing for attics for conditioned and unconditioned space separation. This code excerpts from the 2006 International Residential Code. Subtitle B - REGULATIONS Relating to Housing and Urban Development (Continued) [PDF] - original source www.gpo.gov/fdsys/pkg/CFR-2001-title24-vol5/pdf/CFR-2001-title24-vol5-subtitleB.pdf. (2) Clearances for and protection around gas, propane and electric ranges shall be not less than those provided in Articles 9.10.22.2. and 9.10.22.3. (1) Except as provided in Sentence (2), framing, finishes and cabinetry installed directly above the location of the cooktop shall be not less than 750 mm above the level of cooktop burners or elements. (ii) a metal hood with a 125 mm projection beyond the framing, finishes and cabinets. (1) Except as provided in Sentences (2) and (3), combustible wall framing, finishes or cabinets within 450 mm of the area where the cooktop is to be located shall be protected above the level of the heating elements or burners by material providing fire resistance not less than that of a 9.5 mm thickness of gypsum board. (2) Countertop splash boards or back plates that extend above the level of the heating elements or burners need not be protected as described in Sentence (1). (3) Except for cabinetry described in Article 9.10.22.2., cabinetry located not less than 450 mm above the level of the heating elements or burners need not be protected as described in Sentence (1). (1) Separate air intake and exhaust outlet openings, when located on the same wall or roof, shall be installed so as to avoid contamination of the ventilation air by the exhaust air. (2) Intake openings shall be located so as to avoid contamination of the ventilation air from other local sources such as automobile exhausts and exhaust from adjacent buildings. (3) The distance from the bottom of an air intake opening to finished ground level or to any nearer and lower permanent horizontal surface shall be not less than 450 mm or the depth of expected snow accumulation, whichever is greater. (4) The distance separating air intakes from building envelope penetrations that are potential sources of contaminants, such as gas vents or oil fill pipes, shall be not less than 900 mm. (5) Air intakes shall be clearly labelled as such for identification from locations outside the dwelling unit. (6) The distance from the bottom of an exhaust outlet to finished ground level or to any nearer and lower permanent horizontal surface shall be not less than 100 mm. (7) Where air intake and exhaust openings are in exposed locations, provision shall be made to protect them from the entry of precipitation by the use of louvres, weather cowls or other suitable protection. (8) Air intake openings shall incorporate screens or grilles to protect against the entry of animals and insects. (9) Except for exhaust outlets serving heat recovery ventilators, exhaust outlets shall incorporate backdraft dampers. (10) Except for clothes dryers, exhaust outlets shall be fitted with screens of mesh not larger than 15 mm, except where climatic conditions may require larger openings. (11) Where a screen or grille required by Sentences (8) and (10) has a screen mesh less than 6 mm, the screen or grille shall be removable for cleaning. (12) The gross area of the screens or grilles installed in intake and exhaust openings shall be three times that of the duct served. (13) Screens and grilles shall be of corrosion-resistant material. (14) The net free area of an air intake or exhaust outlet shall be equal to or greater than the cross-sectional area of the duct served. (1) Installation of fans and heat recovery ventilators shall be in accordance with manufacturer’s instructions for minimizing noise and vibration transmission and achieving the required sound rating. (2) Where flow-regulating dampers are required, they shall be adjustable and accessible without requiring the removal of fans, motors, or insulating materials and without the need for specialized tools. (3) Ventilation equipment shall be accessible for inspection, maintenance, repair and cleaning. (4) Ventilation equipment installed in unheated spaces shall be installed so as to avoid condensation of moisture on fans and motors in accordance with the manufacturer’s instructions. Continue reading at BUILDING SAFETY HAZARDS GUIDE or select a topic from the More Reading links or topic ARTICLE INDEX shown below. 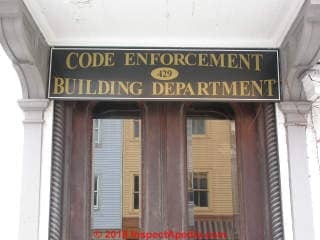 BUILDING CODE DOWNLOADS at InspectApedia.com - online encyclopedia of building & environmental inspection, testing, diagnosis, repair, & problem prevention advice.